1633 Front End Loader is a Town set released in 1990. 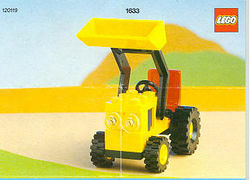 It includes a small model of a yellow, black, and red construction loader. This set was released for a limited time only. Though it is minifigure-scale, none were included. Facts about "1633 Front-End Loader"
This page was last edited on 9 February 2019, at 16:24.